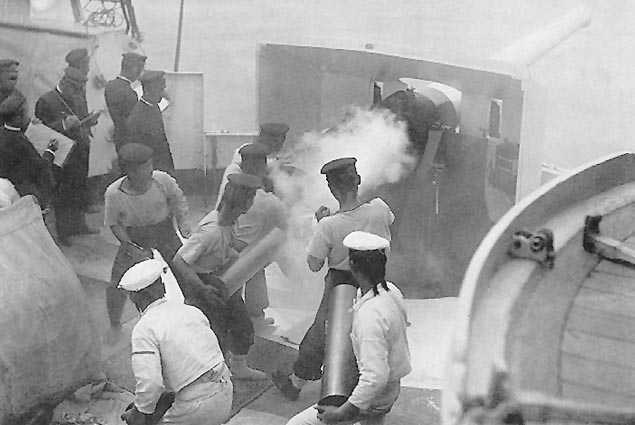 Japanese 6"/40 (15.2 cm) gun in action. Note the observers at left, this appears to be a prize shoot. Elswick guns of various patterns used on battleships and cruisers built around 1900. Some of these guns were still in use during World War II on auxiliary ships and in coastal artillery units. 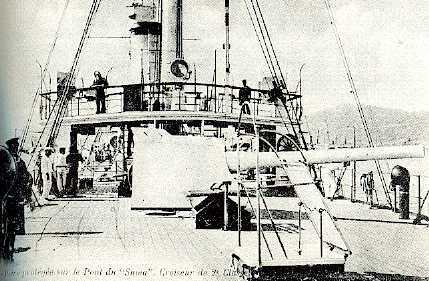 In general, their construction resembled British 6"/40 (15.2 cm) guns of the same era. Japan sent 15 of these guns to Britain in 1915 but they were apparently never used. Japanese guns were redesignated as 41st Year Type on 25 December 1908. Redesignated in centimeters on 5 October 1917. Unless otherwise noted, the data that follows is for Japanese guns, but Elswick guns used by other nations should have had similar performance. ^IS is my abbreviation for the Type 3 Common incendiary shrapnel round (sankaidan) intended for AA use. 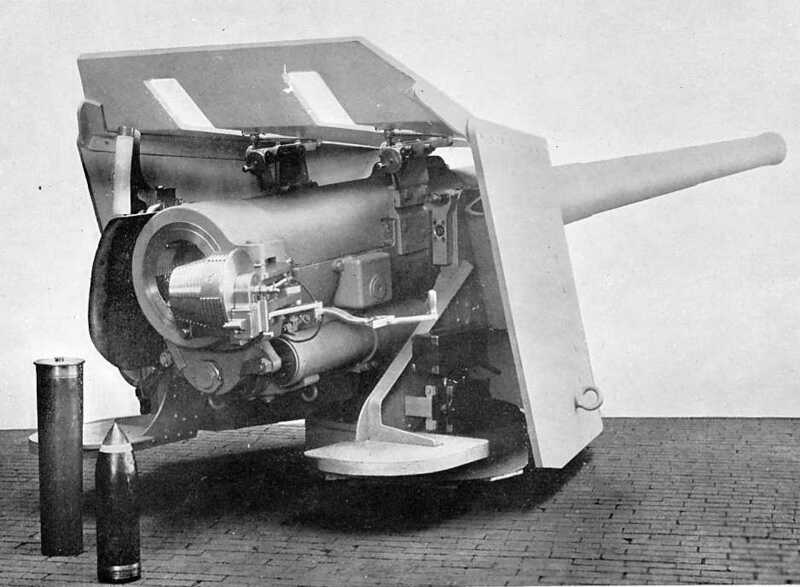 ^The flat-nosed ASW projectile was issued in 1943 following extensive testing. This is listed in US Naval Technical Mission to Japan report O-19 as being able to penetrate a 0.3 in (0.8 cm) plate of Dusol Steel (roughly equivalent to USN HTS) at a depth of 26 feet (8 meters). However, based upon other errors in this document, I would believe this to be an error in metric to english unit conversion and that the actual performance would more likely be 3.1 in (8.0 cm). Range for this performance is not given. Minimum range of ASW shell is given as 875 yards (800 m). Ranges less than this tended to ricochet. 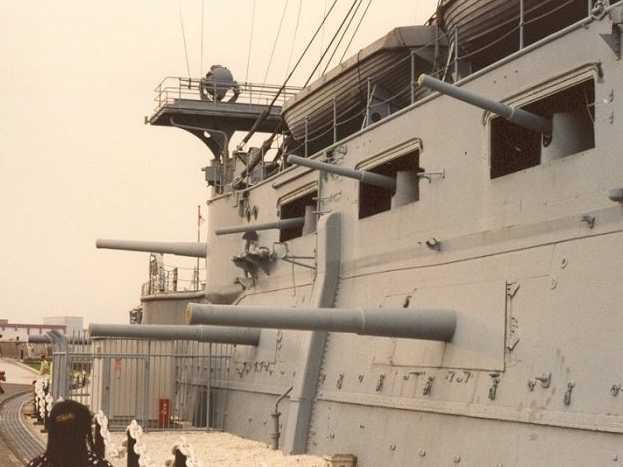 3"/40 (7.62 cm) and 6"/40 (15.2 cm) guns on preserved pre-dreadnought Mikasa in 1990. Mikasa is now a historical museum at Shirahama Beach in Yokosuka. Picture copyrighted by Troy Prince. 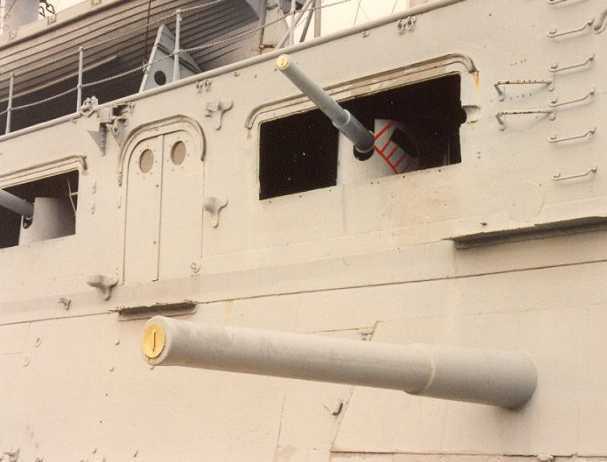 3"/40 (7.62 cm) and 6"/40 (15.2 cm) guns on Mikasa in 1990. Picture copyrighted by Troy Prince. 6"/40 (15.2 cm) gun under construction at the Elswick Works ca. 1898. Photograph Courtesy of Dave Perkins. 6"/40 (15.2 cm) gun under construction at the Elswick Works ca. 1898. Note that this is a three-motion breech, not a Welin Breech Mechanism. Photograph Courtesy of Dave Perkins. "The Battle of Tsu-Shima" articles by John Campbell in "Warship Volume II"